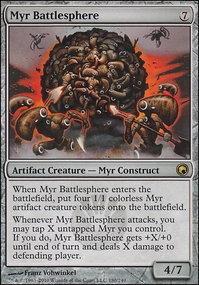 Getting Myr Battlesphere(s) out early (between round 4-6). Produce a lot of Myrs and boost them. Increase the chance of surviving until you get battlesphere out by lifegaining and by getting cards back from the graveyard. The deck is Budget and is fun to play. Check it out! Do you have any advice? Every Door Has a Key.